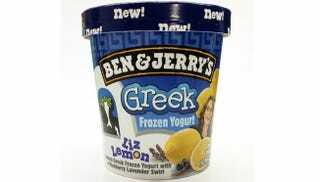 If you've always wondered what Liz Lemon tastes like, and you would like to experience her flavor in frozen yogurt form, Ben and Jerry's has got you covered. 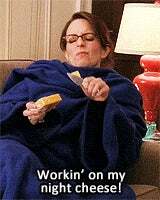 To commemorate/mourn the final episode of 30 Rock, they're releasing "Liz Lemon Greek Frozen Yogurt with a Blueberry Lavender Swirl," which is adorable. And also obviously terrible. First of all, can everyone please stop putting lavender in my food? I am not a bee. Thx. Liz Lemon's Night Cheese is a full-fat ham-flavored ice cream with a swirl of hot dog caramel and chunks of fudge-dipped meatball sub. It comes with no lid so you have to eat the entire pint in one sitting, and also it fell on the floor.